At the crossing of the transepts is the central focus of the interior, the baldacchino. 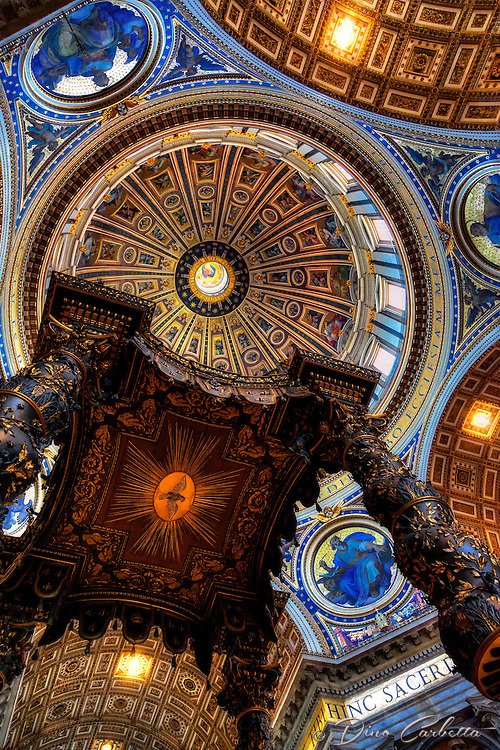 This monumental canopy shelters the papal altar and the holy relics of St. Peter. Artistically, it also serves to fill the vertical space under Michelangelo's great dome. Made of 927 tons of dark bronze (removed from the Pantheon's roof in 1633) accented with gold vine leaves, the baldacchino stands 90 feet tall. The baldacchino was created by Lorenzo Bernini from 1624 to 1633 under the direction of Barberini Pope Urban VIII, who added Baroque embellishment to much of Rome. The spiral columns derive their shapes from the columns of the baldacchino in the original St. Peter's Basilica built by Constantine, which legend has it came from Solomon's Temple in Jerusalem. Cherubs are repeated throughout the monument, giving an overall effect of the Ark of the Covenant. The view from beneath the baldacchino shows the Holy Spirit within a radiant sunburst, which for me stood out from the backdrop of the great dome representing the heavens above. I came to realize during my travels of Italy and viewing the great artistic interiors of the Basilica’s, Duomo’s, and many churches, the idea and intention of the creators of these great structures was to give the Christian visitor a sense of heaven and hope for eternal life. The seemingly dreary life of the Christian world until modern times became transported, and thus transformed to a better place upon entering these magnificent structures of worship. The reverence and appearance of heaven found in these divine churches can only enhance one’s experience and allows each to see with their own eyes…a touch of God’s splendor.